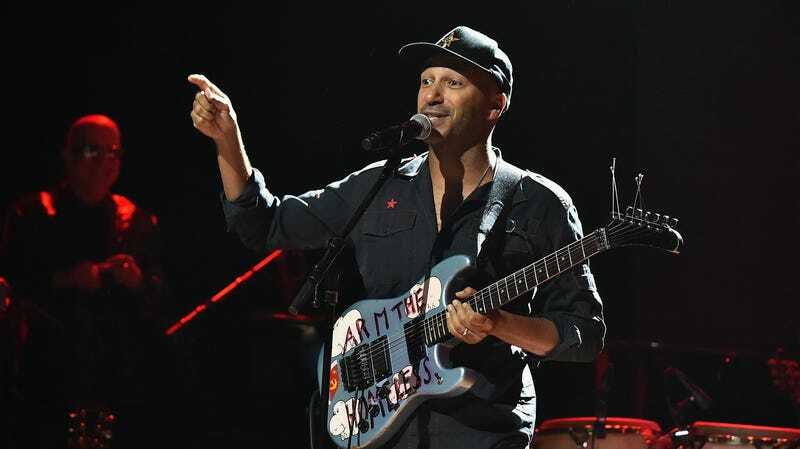 Supergroup Prophets Of Rage is already set to continue its crusade to bring down Donald Trump with another album of political rock music, but Prophets Of Rage’ Tom Morello is also ready to drop a new solo album later this year. As reported by Consequence Of Sound, the album is called The Atlas Underground and it’ll feature a whole bunch of famous musicians alongside Morello including Portugal. The Man, Gary Clark Jr., Marcus Mumford, Killer Mike, Big Boi, Vic Mensa, RZA, Steve Aoki, Bassnectar, and Knife Party. Morello says he wants the album to be like the “Hendrix of now” with “guitar playing that is outside of the norm and is extraordinary.” He also had some high-minded things to say about how the badass talents of his collaborators will hopefully “open people’s eyes to changing the status quo in society.” The album will be available on October 12, and you can hear “We Don’t Need You” with Vic Mensa below.